An Atrium, as technically defined by the International Building Code (IBC) is an opening within a building connecting two or more stories, other than enclosed stairways, elevators, hoist ways, escalators, plumbing, electrical, air-conditioning or other equipment, which is closed at the top and not defined as a Mall. The historical definition of this spatial typology can be traced back to the open-air courtyard of an ancient Roman house (domus) and later as an enclosed space, with the advent of iron and glass roofing systems in the Industrial Revolution. Atrium spaces create a sense of connection to the outdoor environment by allowing natural daylight into the building, while at the same time provide shelter from rain, wind and temperature fluctuations. In recent years, many studies have been performed on the affect of natural daylight in the healing environment. In 2002, Edwards and Torcellini published A Literature Review of the Effects of Natural Light on Building Occupant, and drew clear conclusions that natural light is a benefit to the health, productivity and safety of building occupants. The benefits in a healthcare setting have shown to reduce patient stress, which has a direct relationship to recovery. Increased full spectrum light is shown to improve visibility which is turn reduces staff error, increases productivity and contributes to their overall wellbeing. These spaces are typically public in function. They can be used as the central collection point for vertical circulation in the building or access to multiple departmental entry points. They can also be used as the iconic place of entry or ‘front door’ to a building and have waiting and reception functions. 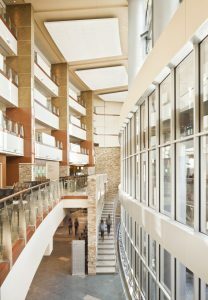 An example of the Concourse atrium is Array’s project at Capital Health Medical Center Hopewell, where a linear circulation zone was developed to connect multiple departments, office suites and waiting areas all the while looking out over a soaring atrium filled with natural light. The Concourse atrium provides the most access to natural light and visibility, however also exposes the greatest surface area to direct solar gain. The geometric benefits of the Concourse atrium are that the public space can be shallow and linear connecting to multiple departments and waiting areas along a single circulation route. One of the many considerations when designing atrium spaces is to take advantage of bringing desired natural light into the building while at the same time mitigating direct solar gain associated with the large expanses of glazing. Solar gain translates into cooling loads, which further equates into energy costs. The opposite, however is true in the winter or heating months, where solar gain is desirable and reduces the mechanical energy required to heat the space. The siting of the building and its configuration are some factors to consider early in the design process to balance the complexities of this space type. Analytical tools can help us during the design process to rapidly reconfigure and test different site, programmatic and geometric relationships of the building and fenestration systems. These indicators help to establish mechanical strategies for the space early in the process, helping to provide a more holistic approach to building performance. 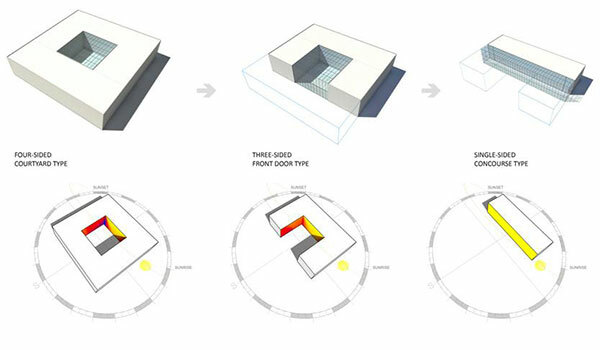 These diagrams illustrate the cumulative solar radiation on the interior walls of the various atrium types. For the purposes of this modeling exercise, yellow is the most intense or indicator of intensity of exposure over time. The analysis was run on the summer solstice when the sun is at its highest point in the sky and we have the longest daylight exposure of the year. The Courtyard atrium is surrounded on all sides, which is useful on large building floor plates by bringing light deep into the floor. The sense of connection to the outdoors or visibility of this space as an architectural feature of the building is limited. Additionally, the wall that faces due south receives the highest intensity of solar radiation, however, the east and west walls are partially shaded by themselves over the course of the day. Since several of the walls will cast shadow into the space, this too has an effect on thermal comfort. The Three-side atrium exposes a façade of the building to the outdoors. Sometimes these configurations have a solid roof and a glazed facade, which helps to further provide shade to the interior space. While the exposure is similar to the courtyard type, the east and west walls receive less coverage because of the exposure the south wall provides. Once heat from the sun penetrates the exterior wall of the building, the only way to mitigate its effect is through ventilation – either natural or mechanical. The primary method of mitigation should be positive shading, in other words, stop the heat before it comes in. One of the ways to do this is through building orientation relative to the solar path specific to the site. This can be accomplished by considering the relationship of the building to the site in plan, as well as thinking about the three-dimensional geometry of the building. Another is to employ high performance glazing in the exterior wall, which can have coatings that reject or reflect the heat of the sun, while permitting the visible spectrum of light into the space. Exterior shading devices can also be used to help provide additional shade. Ultimately a combination of multiple techniques leads to the most robust cost effective solution. Thermal comfort is another consideration when designing atrium spaces. Since the atrium’s main intent is often circulation, the space can sometimes be used as a thermal buffer for the adjacent spaces and can have a slightly higher design temperature to help create a zone between the exterior and programmatic spaces that require more strictly controlled design loads. Mechanical fans can be placed at the top of the atrium to help reinforce stack effect, draw heat out of the top of the space and enable passive ventilation. Displacement ventilation is another technique to condition these spaces and takes into consideration ventilating the areas of circulation and occupied areas only to allow for higher volumes of air to be provided low in the space, which displaces air up to the top the atrium where it can be exhausted. 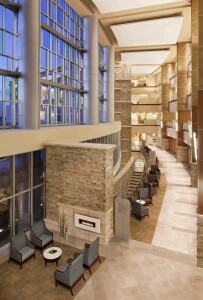 An atrium has unique challenges in regards to the life safety of the building occupants. Smoke generated during a fire is one of the greatest risks to occupant safety and needs to be carefully controlled. In some healthcare spaces, the maximum permitted contiguous area is 22,500 SF. These compartments must be separated by smoke partitions. Additionally, the NFPA life safety code states that if more than three stories are connected or “open” to one another, a smoke control system must be employed. These systems consist of dedicated mechanical equipment and can have a significant added cost impact to a project. The code provides a provision to perform Computational Fluid Dynamic modeling to size and design exhaust locations, which affect the plume of smoke in a space. The nature of modeling the smoke within a space usually results in ‘right-sized’ equipment capacities and may provide cost savings over traditional methods of calculating the Cubic Feet per Minute requirements of the exhaust fans. The design of atrium spaces must consider many factors. They are program driven, mechanically purposefully and architecturally inspiring, while challenging to develop. Several tools can be employed early in the design process to leverage intelligent decisions to maximize desired results and in combination with various types of configurations make the atrium a space of opportunity within a project. Atrium spaces remain a central part of many projects, and provide space for many functions in a healthcare setting. How we program and plan these spaces provides rich opportunities to explore with our clients. Topics: architecture, central, concourse, courtyard, healthcare design, hospitals, solar gain, tony caputo.